I have been impressed with the Federal Government’s far-reaching reform agenda and their commitment to practical implementation through roadmaps for delivery in each relevant sector. Somalia has maintained a positive trajectory but continuing political turbulence could throw it off course. In December, the IMF completed its first review of the third Staff-Monitored Programme, noting satisfactory performance by the Federal Government. In recognition of the country’s significant progress, the World Bank’s 2019-22 Country Partnership Framework unlocked International Development Association financing through pre-arrears clearance grants totalling $80 million to strengthen basic service delivery, improve financial management capabilities, and restore economic resilience. Improvements in public financial management and an expansion of the domestic revenue base with a recorded fiscal balance surplus of $8 million in September means that 56 percent of the Federal Government’s $340 million budget for 2019 will be financed from domestic revenue, with the rest provided by donors. I want to commend the Office of the Prime Minister for leading Government efforts to tackle corruption, including the announcement on 9 December of the Federal Government’s intention to ratify the United Nations Convention Against Corruption. Turning to political progress, the Roadmap on Inclusive Politics covers elections, the constitutional review, federalism and reconciliation. These are essential elements for Somalia’s state-building project. The draft Electoral Law has been submitted to the Cabinet and amendments from political parties, civil society and the international community have been provided. The delay in submitting the draft Electoral Law to parliament will see a key milestone missed as per the Government’s commitment to have the electoral law adopted by December 2018. This will have a possible impact on the timelines with the electoral process. However, the National Independent Electoral Commission (NIEC) is still making headway with pre-voter registration preparations including recruitment and training of new staff, the planning of the mapping of voter registration sites, and the establishment and consolidation of its subnational structure. So far, 35 political parties have been registered. Technical cooperation has continued on the Constitutional Review process, laying the groundwork for real progress at the national level. The Federal National Technical Committee has been negotiating draft political agreements on justice, mineral resource sharing, allocation of powers, and fiscal federalism. Women’s meaningful participation in these decisions is essential. Members of the women’s caucuses from both houses of Federal Parliament recently held the second annual conference for women representatives of federal and state assemblies to consider the Constitutional Review process and preparations for the national elections. Despite these positive developments, the stalemate between the Federal Government and Federal Member States continues to impede concrete progress in defining the federal model, building institutions of state, and in the implementation of the National Security Architecture. The halt to cooperation between the Federal Government and Federal Member States was announced by the Council of Interstate Cooperation on 8 September. After visits to all the regions by the SRCC and myself, there have been encouraging Somali-led initiatives to restore relations. President Farmajo offered direct dialogue behind closed doors, and in October, Prime Minister Khaire established a six-member ministerial committee to work with the Upper House to end the stalemate. However, the landscape is complicated by electoral processes that are currently underway in several Federal Member States. Politics is complex in any nation, but in one that is still establishing its norms, institutional parameters, and still debating the responsibilities of its respective governance structures, there is a risk that complexity shifts to conflict. We witnessed this during the electoral process in South West State. Allegations of interference by the federal government and the violence which erupted following the arrest of one of the candidates, a former al-Shabaab deputy leader, marred the process and does not bode well for the upcoming electoral processes in other regions or for the 2020 national elections. This may also have implications for the likelihood of future al-Shabaab defectors who may be considering exchanging violence for a political path. Regrettably 15 people, including a regional assembly member, were killed during the violence. Strains between the executive and the legislature also came to the surface on 9 December when members of the House of the People submitted a motion for the impeachment of President Farmajo. Completing the demanding legislative agenda requires continued cooperation between the executive and legislature. Discord between the two can seriously hinder Somalia’s progress. I welcome the recent progress made, however, on the passage of the 2019 budget and the pension law before parliamentary adjourned for recess. I strongly condemn the mortar attack on our premises that took place two days ago and the casualties caused by such use of force. In no country are attacks against the United Nations acceptable. As you are aware, three of our staff were injured, one seriously but not critically. You may also be aware that the responsibility for this attack was claimed by al-Shabaab. I welcome the Federal Government’s condemnation of the attack. Al-Shabaab remains the biggest source of insecurity in Somalia. Despite the ongoing operations to degrade the terrorist group, it still has the capacity to conduct indiscriminate attacks on Somali citizens, and to target electoral delegates, the Somali security forces and AMISOM. AMISOM and the Somali security forces operations have succeeded in denying al-Shabaab the possibility of launching conventional attacks. It now relies on Improvised Explosive Devices and targeted assassinations. Of note, on 9 November, al-Shabaab claimed responsibility for a complex attack against the Sahafi Hotel in Mogadishu initiated by three vehicle-borne IEDs. Over 50 people, including seven al-Shabaab militants, were killed in the attack. In Mogadishu and Puntland, pro-ISIS elements have targeted business owners using extortion to extract revenue and conducting assassinations. It appears that the cause of the conflict between the two extremist groups is now primarily driven by financial interests. Their focus is now on extortion of so called taxes. In addition to military operations, it is therefore important to tackle this aspect as well as the infrastructure used by al-Shabaab to assemble IEDs. There has been some progress in building the institutional capacity of the security sector to tackle these threats. Biometric registration programmes for the Somali National Army and the Somali Police Force are forging ahead, an Operational Readiness Assessment of the regional forces is underway, and these processes will hopefully assist the mapping of regional capabilities ahead of future integration of these forces into the National Security Architecture. Implementation of the Transition Plan made an encouraging start but has recently slackened. There will need to be a more comprehensive and better coordinated planning process to achieve the more ambitious transition locations in the timelines contained in the Somali Transition Plan. This must be guided by respect for human rights, appropriate measures towards stabilization, all as agreed in the Transition Plan. Overall, the approach to transition should be conditions-based with progress in building effective Somali security institutions as the main factor setting the pace. We have continued to support conflict resolution and conflict prevention efforts in several parts of the country, in collaboration with other partners. IGAD and UNSOM engaged in shuttle diplomacy between Puntland and ‘Somaliland’ to help them de-escalate the tension in Tukaraq and find a sustainable solution. As a result of the joint mediation effort, a de-facto ceasefire is holding. On the regional level, the tripartite agreement signed between the leaders of Somalia, Ethiopia and Eritrea on 6 September is an opportunity for Somalia to strengthen its regional ties and provide further support to Somalia’s economic, political and security progress. The humanitarian crisis in Somalia remains among the most complex and long-standing in the world. Armed conflict and widespread violence, as well as recurrent climatic shocks, perpetuate high levels of humanitarian needs and protection concerns. While the humanitarian situation has improved compared to last year due to the above average Gu rains, the needs remain high, with 4.2 million people in need of assistance and protection. Of those who need assistance and protection services, almost two thirds are children. Around 1.5 million are severely food insecure at crisis or emergency levels. Around 2.6 million people are internally displaced. The 2019 Humanitarian Response plan, to be announced this month, targets 3.4 million people, or 81 per cent of the 4.2 million people in need of assistance, requiring $1.1 billion for its implementation. Respect for human rights and international humanitarian law and the protection of civilians in the context of the conflict remains key for Somalia’s transition and sustainable peace. 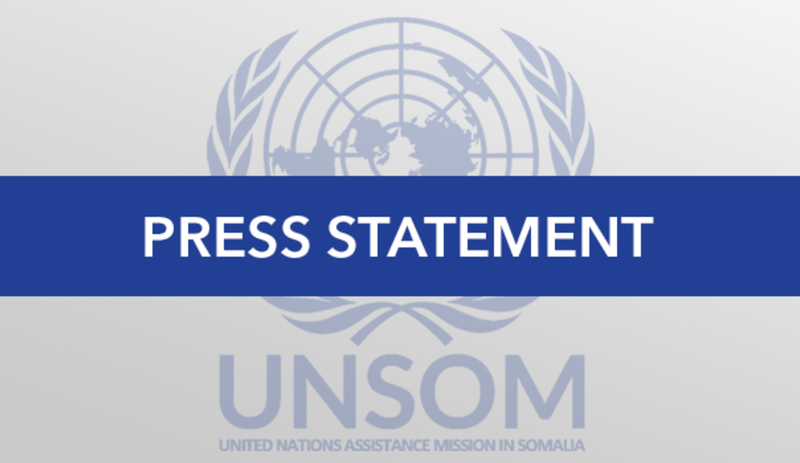 UNSOM has documented 1,384 civilian casualties in 2018, with al-Shabaab accounting for 60 per cent of these. Progress has been made, including taking steps to establish institutions that protect human rights, such as the Federal Independent National Human Rights Commission. I encourage the Federal Government to finalise the Commission’s foundation. Somalia has laid the foundations to make significant progress in 2019. The plans are in place and the milestones are clear. The management of the upcoming regional elections in 2019 and the remaining political processes, particularly the review of the Constitution, will determine whether Somalia makes further progress or not. Achieving this will require all role players to pull in the same direction. Somalia has set that direction and I hope you will be updated on the progress in the year to come.